Confucius said these precious words back in 500 BC. Knowledge can never be seen as a negative aspect because it builds confidence. A person gets a sense of accomplishment, which is a liberating feeling. Education builds confidence and hope, and we believe that every child should get the opportunity to study. By studying, we do not mean to say mugging up the mathematic tables or laws of motion. The path to enlightenment is through education. However, majority of the people have a distorted image of education. Being well-read is one thing and being educated is another thing. Education has a much deeper meaning! When an individual is educated, they feel liberated and fearless. 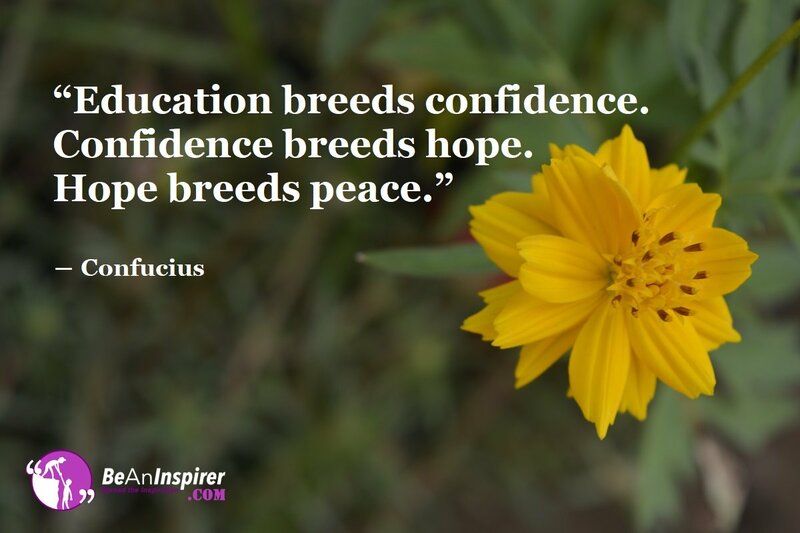 As per Confucius, education breeds confidence and hope, which in turn helps an individual to attain peace. What does this really mean? Thankfully, everyone on this planet has a mind, but majority of them are governed or run by another force. Education promotes independent thinking, and it makes room for new ideas and possibilities. Independent thinkers do not judge and they have their own conclusions. Their thought process is not governed by others. Let me take the instance of my own maid, who took a leave for 4 days because her sister-in-law ran away with another man. I asked her the reason as to why she took that step of running away! Looks like the husband spent several days outside, and ignored the family. The sister-in-law took care of the babies and her life became a waiting station. A man entered her life, and he gave her everything that the husband couldn’t. My maid judged the sister-in-law, but she did not keep herself in the shoes of this woman, who chose love. Our society constantly puts negative thoughts into each other’s head. If we were truly educated, we would never have a narrow mind. We would come to our own conclusions, and not judge everyone around us. The poor is always worried about bread, clean water and some fresh air at night. They constantly fear as to whether they will earn bread tomorrow or not. This fear can lead to anger, aggression, depression, and even suicidal thoughts. I find that criminals are frustrated with their current condition, and they take shortcuts to earn a living. Education builds confidence, but it also decreases the chances of being poor. Don’t you wish to improve your living condition? I find that the kids of auto drivers and rickshaw pullers are topping in the UPSC exam. This is because they know where they come from and wish to improve their living condition. They want to give a good life to their parents! I would be candid here, that the same zeal to achieve success is not seen in people who have everything. I believe that everyone has the right to education. Be it a middle-aged individual or a small child. It is never too late! Education can improve your condition, and it can boost your confidence, and promote independent thinking. If anybody wishes to study further, you must give them the chance to shine.